Not in Kansas anymore: Pennsville woman dedicates entire room to ‘Oz’ Amy Mumink first saw the “Wizard of Oz” when she was 4 and it has been a part of her life since. 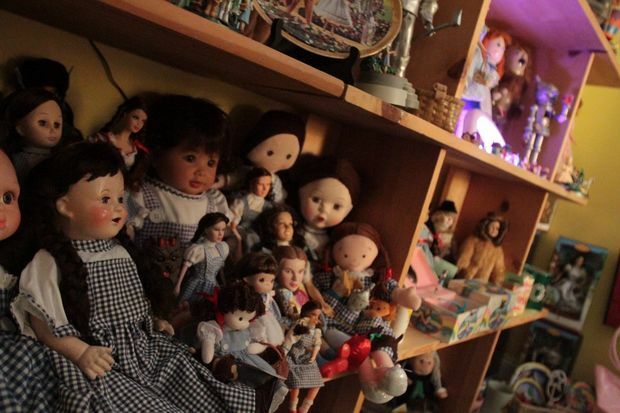 In her room she has a countless number of dolls depicting all the characters from the movie, from Dorothy to the Tin Man. There is also a projector that will cast a rainbow image on the ceiling and a “Oz, The Great and Powerful” movie poster in her window, the 2013 fantasy adventure based on L. Frank Baum’s Oz novels. “I think I got my first collectable when I was about 12,” said Mumink. The first collectable she got was a Glinda The Good Witch doll that, today, is sitting on her shelf. “She is a little worse for wear, but she is still up here.” There have been more things added to her collection since she was 12, including custom-made ruby slippers that she got for her 40th birthday and a letter from the son of a Munchkin with a personal check signed by his mother. Saturday, November 16: Celebrate Toto’s Birthday! Wednesday, December 18, at 2 p.m.: Lux Radio Theatre’s 1950 Christmas Special broadcast of The Wizard of Oz, with commentary by Willard Carroll and Farnsworth Director of Education Roger Dell, in the Farnsworth library. 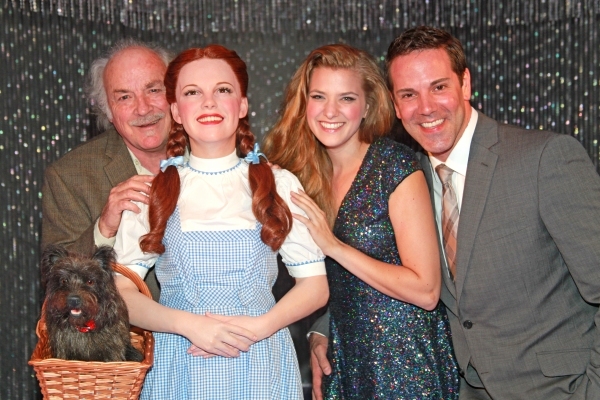 THE WIZARD OF OZ Celebrates Opening at the Pantages Oz cast members also walked the red carpet including Danielle Wade (Dorothy), who was chosen by the Canadian public through CBC TV’s “Over The Rainbow.” Danielle was joined by one of Canada’s most respected and honored actors: Gemini-winner, film and theatre veteran, Cedric Smith (Wizard;) actor/choreographer Mike Jackson (Tin Man) whose credits include Chicago, Broadway/U.S. tour, Contact, U.S. tour;) Lee McDougall (Lion) star of Mamma Mia! (Toronto/U.S. tour) and a Dora Award winner for his play High Life; Jamie McKnight (Scarecrow), known for his performance in The Producers (Toronto) and as one of the Canadian Tenors; Robin Evan Willis (Glinda), star of many Shaw Festival productions; and Broadway and national tour veteran Jacquelyn Piro Donovan (Wicked Witch of the West) who has been featured in Les Miserables, Miss Saigon, How the Grinch Stole Christmas, and Closer Than Ever. The Wizard of Oz: The touring production at the Pantages is relatively enjoyable despite a terrible reworking of the MGM Classic Because the film is still beloved, as evidenced by the success of the recent 3-D/IMAX relaunch in theaters, it is not surprising that Andrew Lloyd Webber saw that the yellow-brick road may yield further gold. However, if I borrowed a book from the library and drew sloppy stick figures and incomprehensible dialogue bubbles on the pages, the library would throw the book back and charge me for vandalism. Andrew Lloyd Webber should be similarly charged with a felony for how he devalued a classic. The Wizard of Oz 75th Anniversary Collector’s Edition This perennial adulation is what leads studios to trot out anniversary editions every few years. The new set’s many tchotchkes — including a notebook, pins, and a snow globe — probably won’t be all that enticing to anyone other than collectors and obsessives, especially with a $105 price tag. But the film’s appeal is somehow still immune to Hollywood opportunism. In the face of such iconic moviemaking, cynicism melts away like a wetted witch. Big celebrations are already underway for ‘The Wizard of Oz’ 75th anniversary MGM’s 1939 Technicolor classic has been converted by Warner Bros. into a remastered 3-D version screening at 300 IMAX theaters through Friday. But that’s just the tip of the ruby slipper for Warner’s $25 million anniversary campaign. Dorothy, Scarecrow, the Tin Man and the Cowardly Lion are already everywhere — in Happy Meals and back on the big screen — and in the coming months are set to appear in the Macy’s Thanksgiving Day Parade and even Dylan’s Candy Bar. The classic also hits the small screen this week. The Food Network’s “Cupcake Wars” hosts an Oz-themed challenge Saturday at 8 p.m., where contestants must bake sweets inspired by the beloved movie. And Thursday, QVC airs “The Wizard of Oz 75th Anniversary Celebration” special, selling commemorative jewelry, toys and beauty products, such as the Julep four-piece nail polish collection with shades like “Ruby Slippers” red for $38.50, or Philosophy’s Emerald City/Yellow Brick Road shampoo, shower gel and bubble bath duo for $33. ‘Oz’ creator’s great-grandsons to attend OZtoberFest Roger and Robert Baum, the great-grandsons of “The Wonderful Wizard of Oz” creator L. Frank Baum, are coming to Wamego to take part in the city’s Ninth Annual OZtoberFest on Saturday and Sept. 29, according to Brooke Rindt, marketing and retail specialist for the Columbian Theatre and Oz Museum, both in Wamego. Roger Baum is the author of more than a dozen Oz books and will be signing copies of his children’s books. Robert Baum and his wife, Clare, will appear in a historical costumed act as L. Frank Baum and his wife, Maud, at the Oz Museum’s Little Theatre. In addition to the Baums, Oz novelist Paul Miles Schneider, of Lawrence, will be signing copies of his books. Johnpaul Cafiero, a Franciscan friar whose family owns the thousands of Oz artifacts exhibited at the Oz Museum, also will attend the festival. Judy Garland documentarian and Oz historian John Fricke will present private video footage of the Hollywood “Yellow Brick Carpet” premiere for Disney’s “Oz the Great and Powerful,” as well as preview his new book, “The Wonderful World of Oz,” and show a recent video interview with the late Munchkin actress Margaret Pellegrini. Also attending the festival is Myra Swensen, known as “the missing Munchkin,” Rindt said. 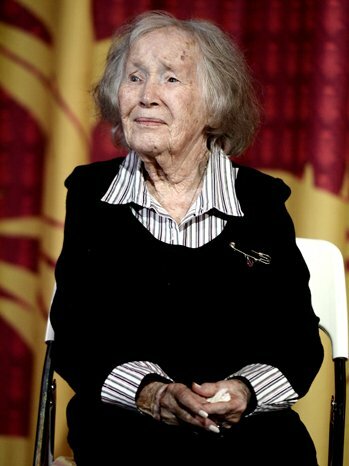 Swensen was supposed to be in the “Wizard of Oz” movie, but she had to withdraw from the film to undergo surgery to remove her appendix. She later married Clarence Swensen, an actor who appeared as a Munchkin soldier in the movie. Jerry Maren, 93 – was at the TCL Chinese Theatre, formerly Grauman’s Chinese Theatre, Wednesday in Los Angeles for a hand-and-foot-print ceremony. The theater is actually the same location of the film’s original Hollywood premiere on Aug. 15, 1939. Maren, dressed very dapper in a checkered shirt and blue sweater vest, proudly sang “The Lollipop Guild” for the crowd and even added a small dance move or two. ‘Oz’ gets $25 million promo, including Munchkin guest The studio is spending an “over the rainbow” amount of $25 million this month for promotion to push the 75th Anniversary launch of the original movie converted to 3D for IMAX theaters. On Sunday, the new 3D film version was screened for celeb guests in Hollywood at the new TCL Chinese Theatre IMAX. This is the same theater space that was originally Grauman’s Chinese Theatre where the film premiered in 1939. Attending Sunday’s all-star event were Mario Lopez, Molly Ringwald, Kevin Sorbo, all posing for photos with the new Dorothy (as played by Garland) wax figure unveiled by Madame Tussauds Hollywood. 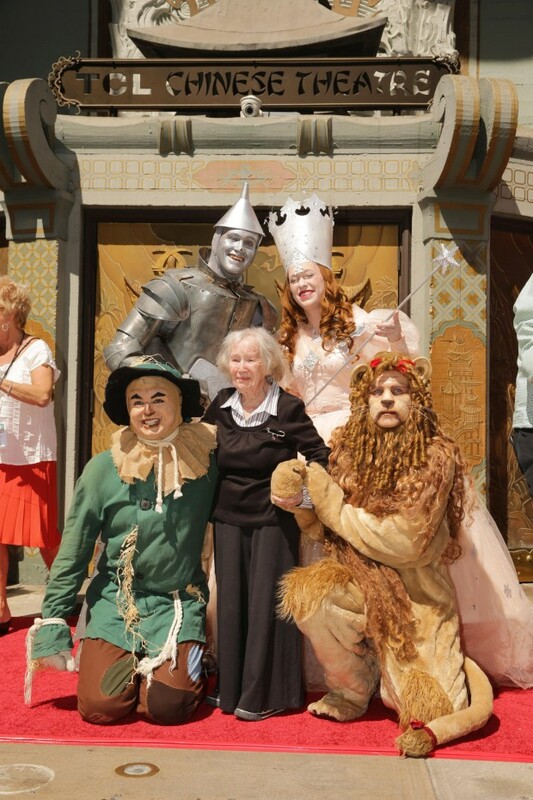 But best of all the special guest of the day was Munchkin Ruth Duccini, 95, one of our regular celebrity guests at the Chesterton Wizard of Oz Festival. She, along with Lollipop Munchkin Jerry Maren, 93, are the final two surviving Munchkins. Oz Revisited: Why We Still Follow the Yellow Brick Road Part I International film remakes have run the gamut from, O to Z, in ‪Japan, Turkey, Russia, Brazil, Mexico and Lithuania. Disney has mounted a sequel (the 1985 Return to Oz) and a prequel (this year’s Oz the Great and Powerful). The Wiz, a black-cast Broadway show, which won a Tony Award for Best Musical and ran for four years, was filmed in 1978 with Diana Ross as Dorothy and Michael Jackson as the Scarecrow. The stage musical Wicked, a revisionist tribute to the mean, green Witch of the West, has been entrancing Broadway audiences for the past decade. It will mark its 10th anniversary on Oct. 20. Oz Revisited – Part 2: How They Made It Wonderful In many ways Baum prefigured Walt Disney (who in the 1930s had hoped to make an animated feature of the Baum book, but MGM secured the rights first). He invented characters that lodged in the popular imagination, then extended their lives in sequels and translated them into other media. Like Disney, Baum became nearly as famous as his creations, not by hosting a TV show but by touring cross-country. And in 1905 he announced an Oz theme park, which he never realized. In fact, his dreams crashed when he invested much of his fortune in Oz movies. That made him another kind of American icon: the big dreamer who can’t write himself a happy ending. First review: ‘The Wizard of Oz’ in 3-D Kudos to the 3-D technicians who have precisely calibrated the stereoscopic effects, most lightly used (but still noticeable) in the black-and-white Kansas scenes, except for the tornado which was never anywhere quite as effective in 2-D. Most terrifying in the Technicolor main portion is the attack of the flying monkeys, which blows away a similar-sequence in this year’s “Oz, the Great and Powerful,” which was actually shot in 3-D. As James Cameron demonstrated with the conversion of “Titanic,” 3-D is best used to accent important objects and things — like the ruby slippers and the Wicked Witch’s nose. The vintage special effects hold up extremely well — the sole exception being the crude back projection when Dorothy’s house is traveling to Oz during the tornado, which is mostly played for laughs anyway. The crowd shots — the Munchins and the throngs in the Emerald City — are handled nicely. The obviously painted backgrounds in some scenes are gently sculptured. Danger Ensemble and la Boite’s vivid reimagining of Dorothy’s trek to the Emerald City has a real cracker of a central concept; an idea that plays with identities and realities, simultaneously exploiting our familiarity with the tale, and distancing itself from it. Dane Alexander’s compelling score might be about as far from Over the Rainbow as Judy is from sober, but we have Dorothy, Toto and their unfeeling, cowardly, brainless companions. (Although admittedly, Toto used to smoke less). All that’s missing is the ruby slippers – transformed here into teetering silver platforms. It all looks very convincing, with Simone Romaniuk’s exhilarating costumes setting the tone for the performance in this interesting space; the munchkins as neon rave kids, a hipster scarecrow, lion and tin man, and the wicked witch, swathed in a sculptural dress, adopting the stance of a high-fashion model. It’s fabulous – and stimulating – to look at, properly intergrated into a show that aims to confront and surprise.